Medical experts from the Sheikh Zayed Institute for Pediatric Surgical Innovation at Children’s National Health System traveled to Abu Dhabi from December 15-19 to teach Emirati students about medical robotics. Craig Peters, MD, and Kevin Cleary, PhD, were part of the TECH QUEST program developed by the Advanced Technology Investment Company in Abu Dhabi. Dr. Peters and Dr. Cleary taught over 80 high school students how to build and program the Lego Mindstorms robotics hardware and software. 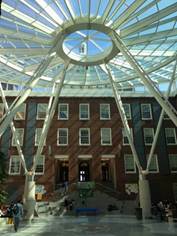 The course was taught on the campus of Masdar Institute of Science and Technology. “The course was a tremendous opportunity for us to educate the next generation of Emirati leaders about the potential of medical robotics”, said Dr. Peters, a urologist who leads the medical robotics program at Children’s National. “Hopefully we can interest more young people in careers in medicine and engineering”. “I was impressed by the caliber of students who came to the course” said Dr. Cleary, the Technical Director of the Institute’s Bioengineering Initiative. “The students worked very hard and made great progress in a very short time”. 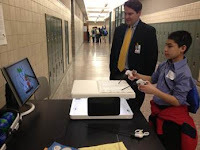 The medical robotics educational module was developed by Dr. Cleary and Dr. Peters with the assistance of Aseem Jain, an intern at Children’s from the Thomas Jefferson High School in Alexandria, Virginia. The module consisted of two parts: a hardware module and a software module. The medical scenario was a 14 year old child with a mass in the kidney that needed a biopsy. To simulate the scenario, we used jello cups with a bean in the middle as a target. After the students built the robot hardware and programmed the software, there was a competition to see which group could come closest to targeting the bean with a thin wooden needle. 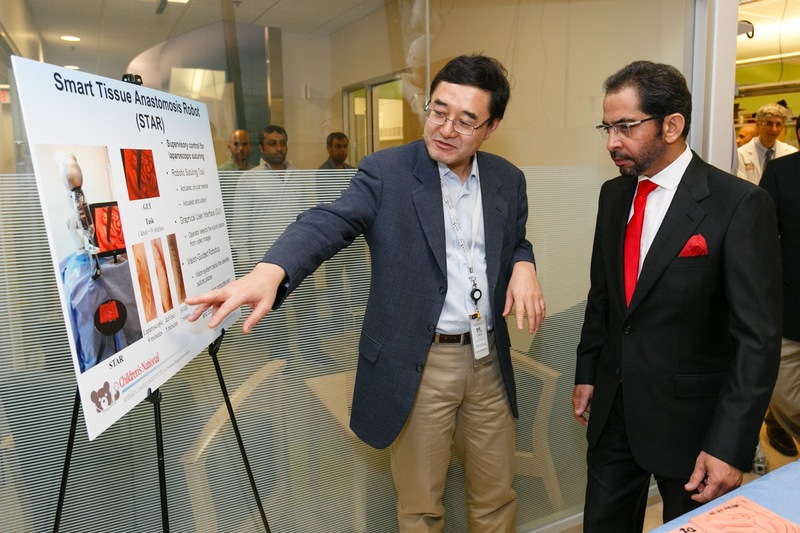 Investigators from the Sheikh Zayed Institute for Pediatric Surgical Innovation at Children’s National Health System are part of the first cohort of the DC Innovation Corps (I-Corps), a National Science Foundation (NSF)-supported program aimed at translating the region’s most promising medical research into successful startups and licensed technologies. 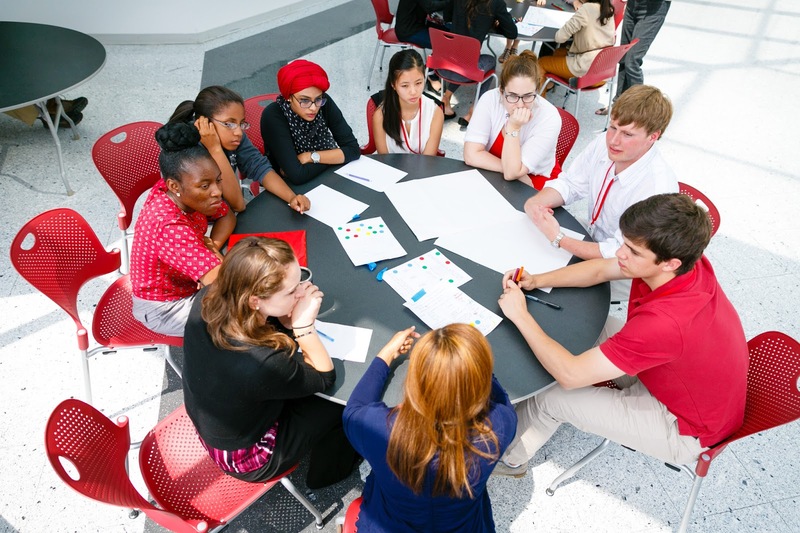 The institute investigators comprise three of 21 teams of aspiring inventors and entrepreneurs from academic institutions in Maryland, Washington, DC, and Virginia. The DC I-Corps program is a seven week program hosted by the University of Maryland, George Washington University, and Virginia Tech that will teach the innovators how to identify a product-market fit for their idea, and develop a scalable business model at the same time—an approach based on the Silicon Valley-style Lean Startup Model. The Children’s National teams are each led by a Joseph E. Robert, Jr., Fellow in Pediatric Surgical Innovation, a hybrid medical and business fellowship at Children’s that is designed to engage young medical professionals in the full spectrum of creating innovative approaches in pediatrics. “The lean start up method focuses on product market fit and each team in the program consists of an entrepreneurial lead, a principal investigator and an industrial mentor. In the seven week duration of the program, the teams are required to conduct 100 interviews to tease out what really drives customer demand,” noted Floortje Blindenbach-Driessen who mentors the Robert Fellows and is also involved in the DC I-corps program. ChronoKair: comprehensive healthcare smartphone/tablet application covering a patient's entire hospital course. Entrepreneurial Lead: Kelly Swords, MD, MPH, urologist and pediatric urology fellow and adjunct faculty, the George Washington University, and 2012 Robert Fellow. Patient mounted CT/MRI-guided needle placement robot: small and lightweight robot for needle placement under CT/MRI-guidance for biopsy, ablation and therapeutic/contrast agent injection. Entrepreneurial Lead: Reza Seifabadi, PhD, a biomedical engineer with medical robotics and devices background and a 2013 Robert Fellow. Smartpupillometer: smart phone application for measuring pupil size and reactivity in different clinical settings. Entrepreneurial Lead: Mariana Mafra Junqueira, MD, anesthesiologist and pediatrician, and 2012 Robert Fellow and Gabriela Calhoun, M.D., anesthesiologist, 2013 Robert Fellow. DC I-Corps is a regional program designed to foster, grow, and nurture an innovation ecosystem in the nation's capital and the mid-Atlantic region. The program is sponsored by the NSF and is part of a national network of five regional nodes selected by the NSF to participate in the I-Corps program. This cohort began on October 7, 2013. 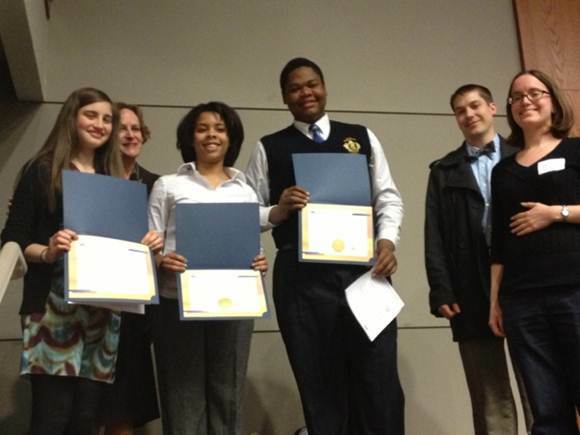 Read more about the first cohort of the DC I-Corps or learn more about the DC I-Corps program. Dr. Ahsan Khandoker, assistant professor of biomedical engineering at Khalifa University is working with the Sheikh Zayed Institute to develop a low-cost tool that could help pregnant women screen their unborn child's health, from the comfort of their home! 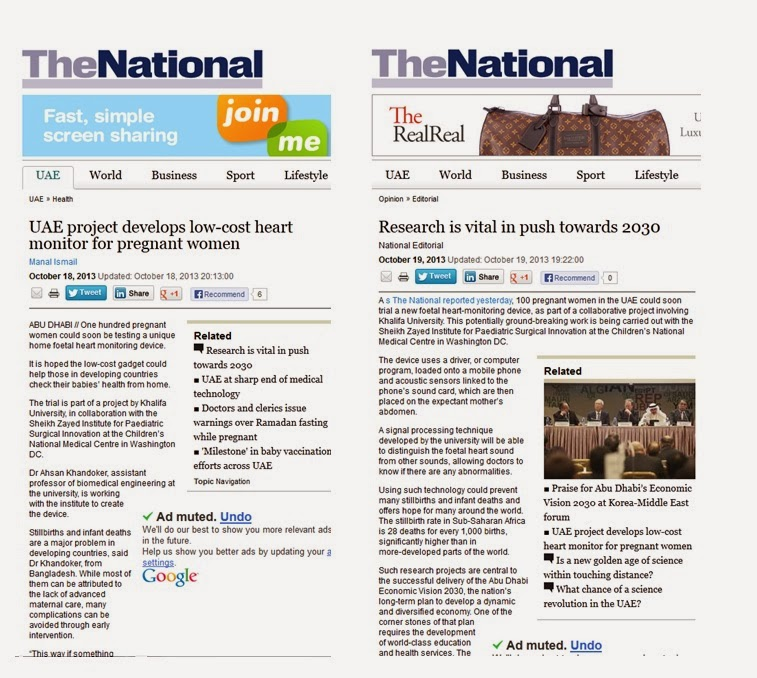 The National, a major publication in the United Arab Emirates, posted two stories about the collaboration and research. 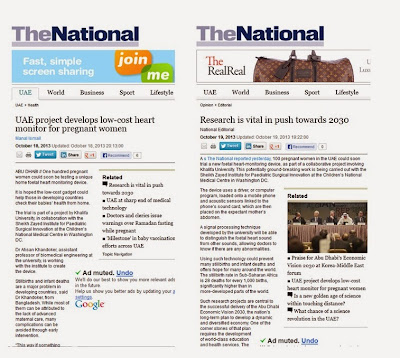 To read the entire article, visit The National's website. The Sheikh Zayed Institute for Pediatric Surgical Innovation at Children’s National Health System has received a grant from the Food and Drug Administration (FDA) to form the National Capital Consortium for Pediatric Device Innovation. The grant is for $700,000 for FY2013, as part of an anticipated five year award. 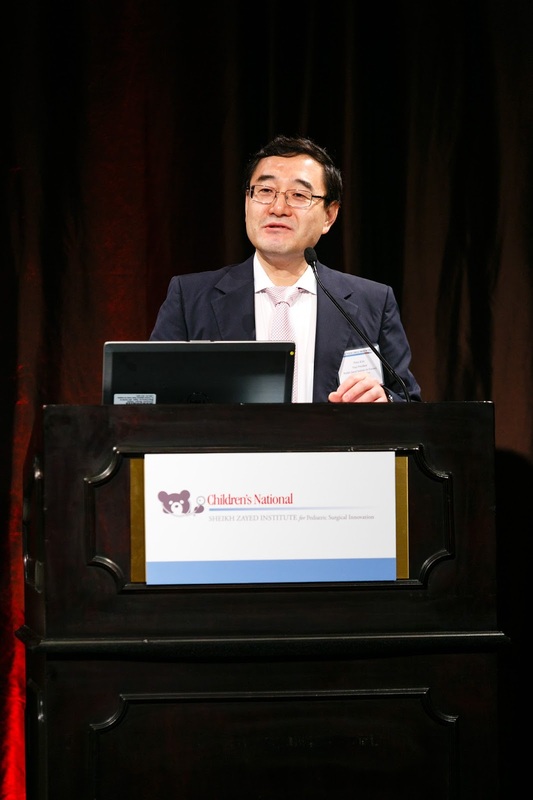 “We are excited to unite within this consortium the diverse strengths of our distinguished partners and collaborators, to bring important advances to medical devices for children,” said Peter Kim, MD, CM, PhD, Vice President of the Sheikh Zayed Institute for Pediatric Surgical Innovation at Children’s National. “In pediatrics, we know that children are not simply small adults, so the FDA’s support for this area of innovation is particularly important to address this critical but largely unmet need.” The NCC-PDI will be a collaboration of Children's National Health System with the University of Maryland A. James Clark School of Engineering and its flagship institutes: Maryland Industrial Partnerships (MIPS) and Maryland Technology Enterprise Institute (Mtech). For-profit, academic, and medical association partners in the consortium include Arent Fox, Oblon Spivak, Medical Murray, Key Tech, Philips, Cook Medical, Medtronic, QUASAR, Root3 Labs, Weinberg Medical Physics, JustRight Surgical, Georgetown University Medical Center, The George Washington University School of Business and School of Medicine and Health Sciences, George Mason University, Howard University College of Medicine, Anne Arundel Medical Center, Howard Hughes Medical Institute, Virginia Tech, Vanderbilt University, Johns Hopkins University, Sickkids Toronto, Texas Scottish Rite Hospital for Children, American University Kogod School of Business, National Institutes of Health/Clinical Center, Medical Device Manufacturers Association (MDMA), The World Federation of Associations of Pediatric Surgeons (WOFAPS), and American Pediatric Surgical Association (APSA). The grant was awarded by the FDA’s Office of Orphan Products Development in its third round of funding since 2009 to consortia that advance the development of pediatric medical devices. The 2013 grants were awarded to consortia that brought together teams with excellence and expertise in delivering business, regulatory, legal, scientific, engineering, and clinical services for children. All consortia work collaboratively with the FDA to help innovators effectively navigate existing laws, regulations and agency guidance to protect the health and safety of children. A team from the Sheikh Zayed Institute at Children’s National recently returned from a wonderful trip to Abu Dhabi! During the visit, our CEO Dr. Kurt Newman and our Chairman of the Board Mr. Jim Lintott had the privilege of meeting with His Excellency Falah Al Ahbabi, General Manager of Abu Dhabi Urban Planning Council, to discuss the importance of high quality pediatric care in Abu Dhabi. AMEInfo covered their visit, posted here. The team was also honored and pleased to speak with the esteemed leaders and teams at Advanced Technology Investment Company (ATIC), Abu Dhabi Technology Development Committee (TDC), Abu Dhabi Council for Economic Development (ADCED), Health Authority – Abu Dhabi (HAAD), and Khalifa University, who all share a passion for educating our next generation and encouraging them to pursue careers in medicine and technology. Dr. Peter Kim (r), Vice President of the Sheikh Zayed Institute, and Dr. Kevin Cleary (l) met with Dr. Omar Shafey, an Acting Manager in the Public Health & Research Division at HAAD, during their recent visit to Abu Dhabi. At Khalifa University, Dr. Kevin Cleary, Technical Director of Bioengineering at the Sheikh Zayed Institute, had the great opportunity to present before a class of biomedical engineering students. He talked about the importance of engineering to the medical field, and highlighted some of his specific areas of research in robotics, medical devices, and medical imaging. He showed video and photos of the Sheikh Zayed Institute’s state-of-the-art Pain Medicine Care Complex and talked about his work with the 3D printer. He also talked about ongoing research projects that the Sheikh Zayed Institute is conducting in partnership with Khalifa University - all with the goal of making pediatric surgery more precise, less invasive, and pain free. Several of the 2013 Student Innovators from Khalifa University were in attendance, and shared their personal experiences at the Sheikh Zayed Institute, and the hands-on research they were able to conduct during their summer internship. We hope their stories inspire even more students to join us from Khalifa University and across the UAE for next Summer’s program. 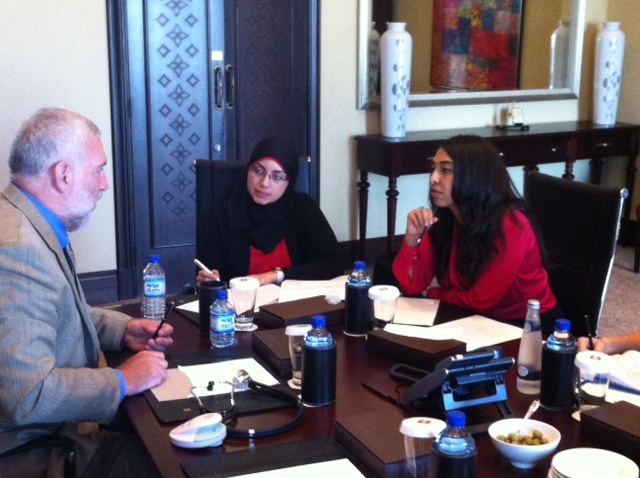 Dr. Kevin Cleary speaking with reporters in Abu Dhabi. Following his presentation, Dr. Cleary sat down with two reporters to discuss the important role of robotics and engineering in the medical field as well as the shared vision between Children’s National and Khalifa University to train the UAE’s next generation of scientists, engineers, and physicians. 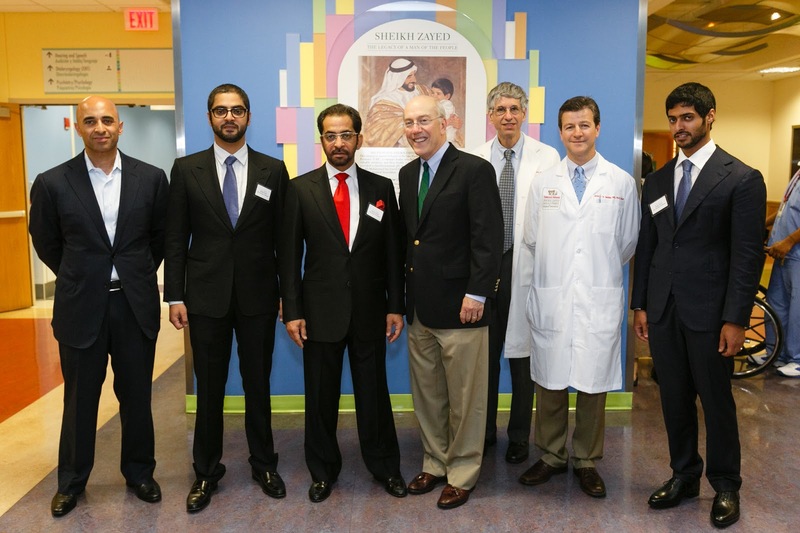 The Sheikh Zayed Institute for Pediatric Surgical Innovation at Children’s National Medical Center is facilitating an international consensus paper as an outcome of its first annual International Symposium on Pediatric Surgical Innovation, held in June to discuss the current status and challenges to pediatric surgical innovation and medical device development. The symposium included discussions such as strategies for seeking regulatory approval in the top three medical device markets – the United States, the European Union, and Japan. Following the day-long symposium, the organizers held a closed session with key opinion leaders and speakers from the conference to begin the formation of the white paper, which will be published in the last quarter of 2013. This document will outline a consensus from world-renowned thought leaders on recommended priorities and changes to address current challenges and to speed advances in pediatric surgical innovation and device development. The white paper will address the unique nature of innovation in pediatric surgery and device development, current regulatory pathways, economic models, ethical concerns specific to medical product development for the pediatric population, the impact of regulatory standards worldwide, and best practices that might be shared across different regions of the globe. Topics the white paper will address include the FDA’s 510(k) clearance process, which applies to most pediatric medical devices, based largely on equivalence to existing devices created for adults. The white paper will also discuss factors related to the small size and vulnerable nature of the pediatric population, which presents distinct challenges for surgeons, researchers, manufacturers, and regulators in device development for this population. The Sheikh Zayed Institute symposium drew nearly 250 high-level participants, including representatives from the U.S. Food and Drug Administration, European Medicines Agency, Japan’s Pharmaceuticals and Medical Devices Agency, U.S. National Institutes of Health, American Academy of Pediatrics, American Pediatric Surgical Association, World Federation of Associations of Pediatric Surgeons, children’s hospitals, pediatric device consortia, device makers, and experts in intellectual property and regulatory science. Presentations from the Symposium can be viewed here. American children ages 5-14 experience an average of one or more sports-related injuries per year, often involving internal derangement of shoulders, hips, wrists and other joints . In such cases, arthrography can assess the condition of a joint, using imaging modalities such as computed tomography (CT) or magnetic resonance imaging (MRI). The modality of choice to diagnose soft-tissue injuries in children is magnetic resonance (MR) arthrography since it involves no radiation and provides higher soft-tissue contrast than CT imaging. However, currently MR arthrography requires two separate stages: an intra-articular contrast injection guided by fluoroscopy or ultrasound, followed by an MRI. In typical interventions, the physician guides a needle using cross-sectional images, often requiring multiple passes to reach the target. In MRI-guided interventions, patient access can be difficult, especially in closed bore scanners. The inability to leverage the imaging capabilities of the MRI itself to guide the needle and the manual nature of needle placement lead to increased cost, anxiety and in some cases prolonged sedation time - especially for the youngest and most anxious patients. To address these limitations, researchers and engineers in the Sheikh Zayed Institute are developing a novel, patient-mounted CT and MRI robotic system to provide better targeting, improve the clinical workflow and allow better access with the MRI scanner bore. Developing equipment compatible with a high magnetic field is the major challenge for a robotic system in MRI-guided interventions, so as a first step the Sheikh Zayed team has developed a CT-compatible prototype for shoulder and hip arthrography for pediatric use. 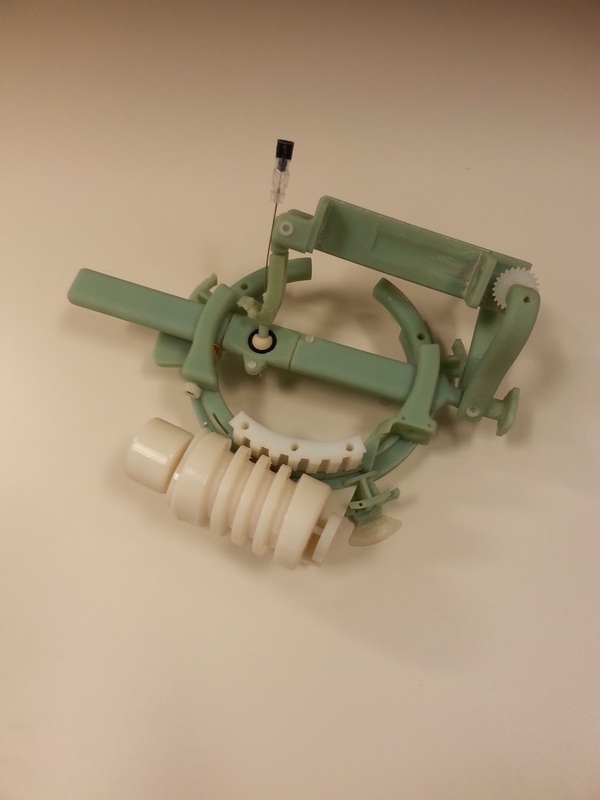 This small and lightweight robot uses adhesive tape and straps for stable attachment to the patient's body. During procedures, major portions of the robot can be covered with sterile plastic sheets, and the remaining parts can manufactured to be disposable or to be sterilized for re-use. Solidworks 3D model of the final design. The robot will connect to a computer through a Galil motor controller. Software—a dialog-based MFC application in Visual C++ on the Windows operating system—will convert input from the user interface devices into control signals to drive the robotic mechanism. 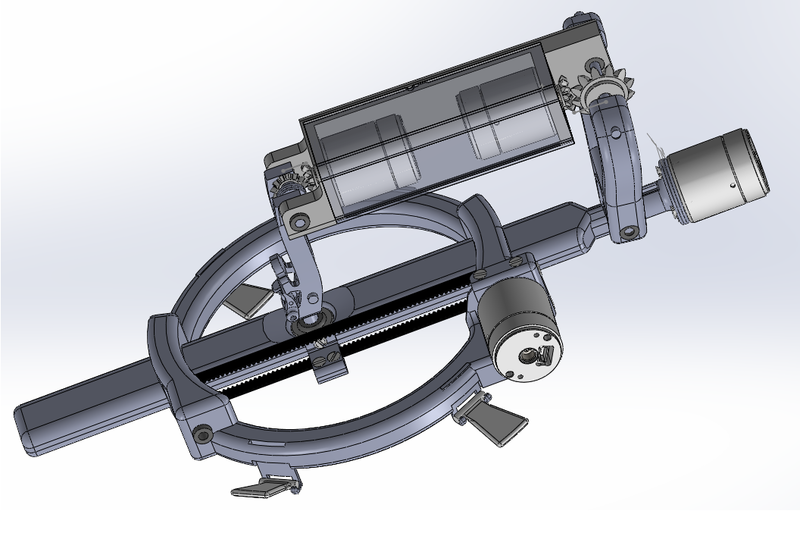 The prototype has three degrees of freedom for needle guidance and insertion. Two possible approaches will be tested for guiding the robot: 1) the physician controls the robot from the MRI control room with a joystick; or 2) the robot pre-aligns its trajectory to a commanded path on the MRI images and an indication from the physician of the target, and the physician manually drives the needle to the target while the robot maintains the trajectory. With the initial design and prototype completed, the next step is to demonstrate the workflow and targeting capability in the CT environment. Ultimately, the team plans to develop an MRI-compatible robot capable of automatically driving a needle and injecting contrast material during a real-time MRI sequence to observe joint function and make an accurate diagnosis, shortening and streamlining procedure times for children. Shital Parikh, “The Trend of Pediatric Sports and Recreational Injuries in the U.S. in the Last Decade”, American Academy of Orthopaedic Surgeons's (AAOS) Anual meeting, 2013. As we enter the last week of Ramadan (August 7th), we asked several women from the UAE studying with us here at the Sheikh Zayed Institute, two members from the Student Innovators Program, and one, a pediatric resident, to share their thoughts on Ramadan and what this special time of year means to them. Ramadan is a special time of the year when Muslims around the world take a step back from their daily routines and focus on community, charity, fasting, and prayer. Muslims use this month to re-evaluate their lives - make peace with those who have wronged them, strengthen ties with family and friends, and do away with bad habits. As Ramadan helps us to develop our moral discipline, it also reminds us of the plight of those who live in constant hunger and deprivation. We are reminded by the revealed book (Qur'an) that religiosity is insincere and meaningless if it does not lead people to care and share. We are also told in the Qur'an that we will not attain righteousness until we spend of what we love. In other words, we must learn to empathize with the hungry and needy people and be willing to part with some of our dearest possessions, for the sake of others. Ramadan is a great opportunity to share Islam's values of spirituality, generosity, and kindness with others, especially your neighbors. Charity plays an important role in Islam throughout the year and especially during Ramadan. One of the simplest acts that I usually do in my daily life is helping others in opening the door. Also, I put a small container filled up with water beside the window or in the garden for the little birds, so they can drink from it. Every time I do something related to charity, I remember my father's saying: "Keep doing the best and the simplest deeds to help needed people. You do not realize how much they need it." The desire of serving the community and helping others motivated me to be involved in biomedical engineering. I believe deep inside myself that the key of your inner happiness depends on the number of smiles you have drawn upon others faces. Fasting during Ramadan makes us value the graces that we have, especially food and water and to feel the suffering of the unfortunate. I remember seeing a woman being interviewed on TV during Ramadan. She put a pot on a fire and started to move the spoon inside it, the sun was about to set and people started to get ready to have their breakfast. A TV anchor asked her about her living condition and what does she eats normally. She replied that she was doing really well and had everything she needed to live, that God had given her everything. The anchor man was surprised about the reply, because the lady was living in a tent. Then, his eyes went toward the pot, and he jokingly said, "are you making us the breakfast?" She didn't reply. He looked inside the pot, and it was empty! He asked her what she was doing. She said: "I don't have anything to cook, and I started my fire because I know that God will take care of me and will not let me down." It was one of the saddest scenes that I have ever seen. I believe that people were created to help and support each other. The fortunate must help those who are less fortunate, no matter of their race or religion. “During the first day, we learned about the process of creating innovative ideas and techniques to use to maximize the quantity and quality of our ideas. On the second and third days, we were able to form groups, decide on an app, further develop our app, and formulate a concise presentation to make to potential stakeholders. This entire experience was very novel for me and I enjoyed learning, for the first time, about the science of innovation. This is something that will be useful in my future profession as a physician because it is important to know how to continuously create new avenues to help patients, both young and old. Not only did I get to learn about innovation, but my team and I now have the opportunity to pursue our application further, and possibly be able to help many children tackling obesity." After a judging period, two teams received prizes for “best overall solution” and “best overall design.” Currently, three of the teams (including the two winners) are working with Sheikh Zayed Institute leaders to develop business plans and apply for provisional patents for their ideas. This week marks the start of one of the holiest periods on the Islamic calendar - Ramadan. This month is a time of fasting, devotion, introspection, and charity when Muslims strengthen spiritual bonds with family, friends, and colleagues. We send our most sincere wishes for peace and happiness, have a Blessed Ramadan. 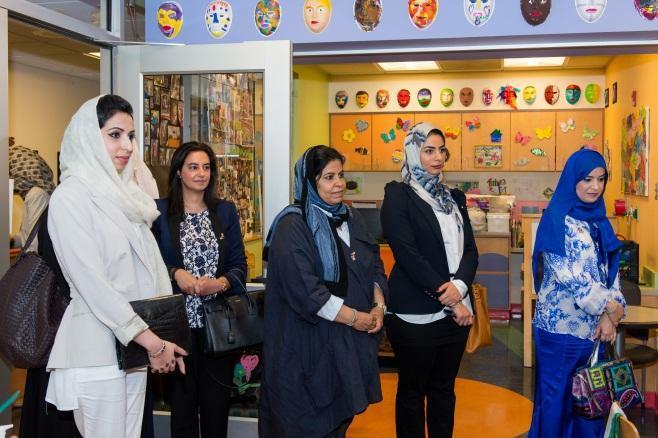 Children’s National was excited to host a distinguished delegation of female leaders from the United Arab Emirates on Tuesday, June 25. The group included women from the UAE Federal National Council, UAE Ministry of Foreign Affairs, Zayed Military Hospital, as well as from top business and media organizations. The women were in town to meet with senior leaders in the U.S. Government and the private sector to discuss international women’s issues and gender equality, as well as how partnerships between the U.S. and the UAE can strengthen roles for women in the workplace. 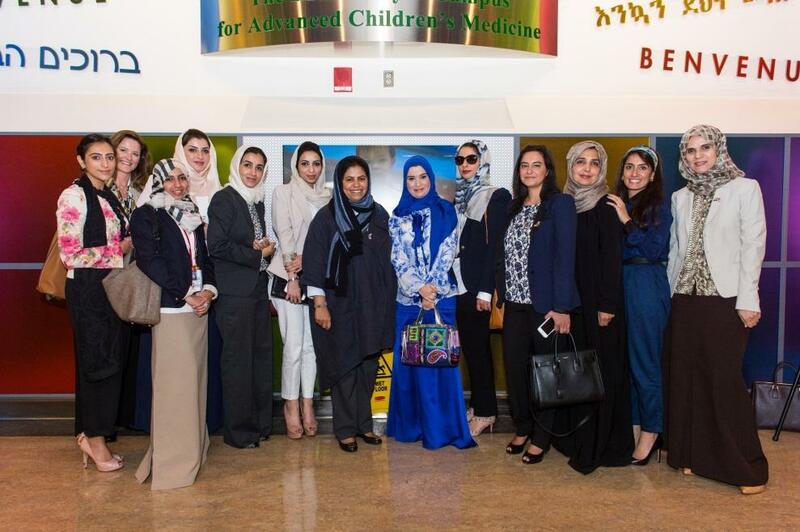 Pam King Sams, Vice President for Development at Children’s National, and Noura Aldhaheri, a pediatric resident, welcomed the delegation of UAE women leaders and members of the UAE Embassy staff to the hospital on Tuesday. While at Children’s National, the group toured the Hematology and Oncology Unit, where they were able to meet some of our children who are going through cancer treatment and see the many resources available to help the children and their families heal – including our art therapy room. 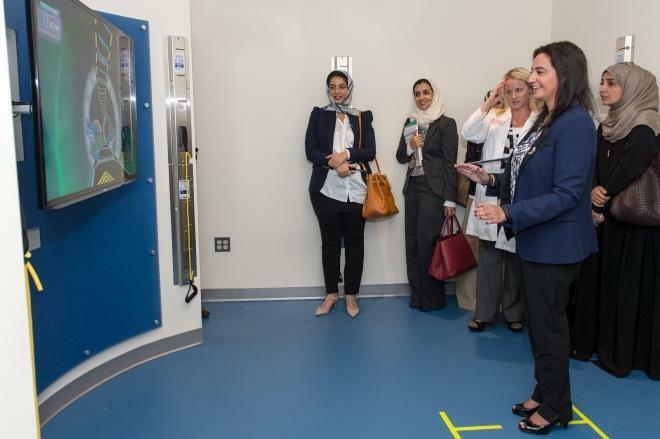 The group also toured the labs of the Sheikh Zayed Institute for Pediatric Surgical Innovation and the Pain Medicine Care Complex, where they were able to hear about some of the latest research being conducted and new technologies that are already helping alleviate pain for children worldwide. LEFT: The group also visited research labs in the Sheikh Zayed Institute and met our Student Innovators from the Khalifa University. 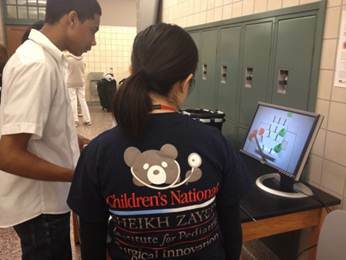 RIGHT: One member of the group tried out the multi-sensory gaming technology used to help manage pain in children. BOTTOM: The women spent time in an art therapy room to learn about the many ways that Children’s National helps children through the healing process. A central discussion theme throughout the day was sustainability—how do we best encourage and train our next generation of leaders, including physicians, scientists, engineers, and most importantly women. We were able to learn from the impressive experience of our guests and share our own insights and ideas for the future. It was an exciting exchange, and we certainly look forward to many more opportunities to collaborate with this very accomplished group of women. 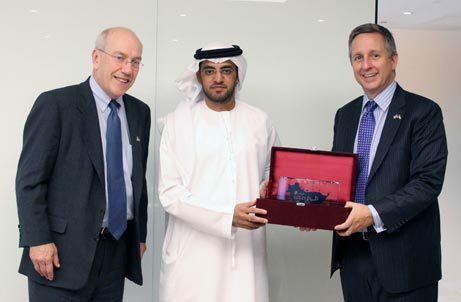 In addition to their visit to Children’s National, the delegation met with representatives from the U.S. Congress, the State Department, as well as private companies that operate in the UAE. 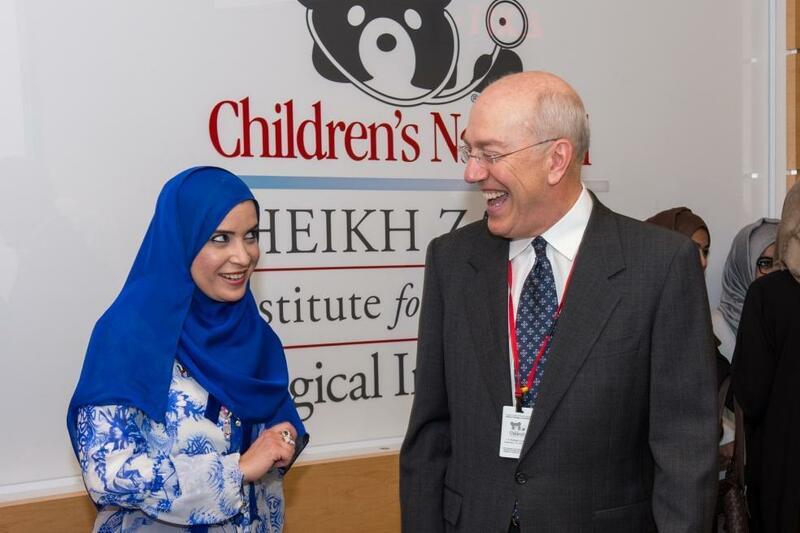 Dr. Kurt Newman, CEO of Children’s National, spent time with the delegation and shared a laugh with Her Excellency Dr. Amal Abdullah Juma Al Qubaisi, the Deputy Speaker of the UAE Federal National Council and leader of the UAE women’s delegation. 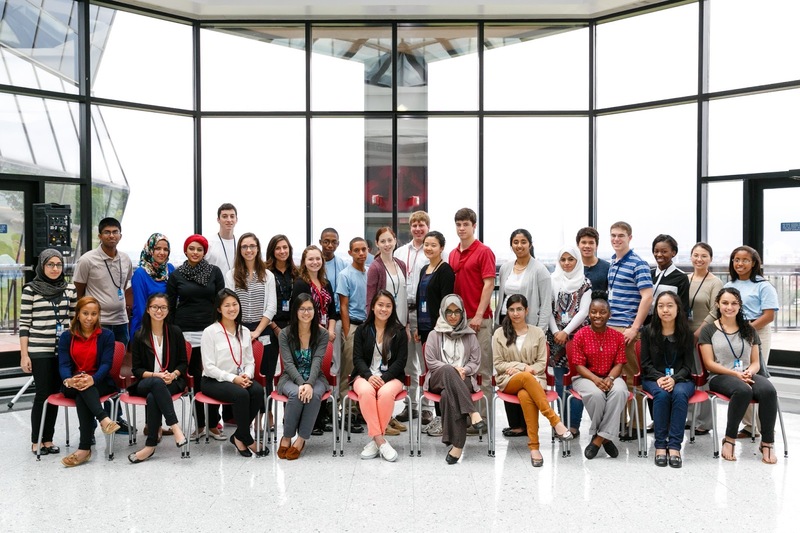 This month, 31 students from around the world arrived at Children's National Medical Center for the 2013 Student Innovator Program. The students will spend 2 months immersed in the Sheikh Zayed Institute's innovative space, where they'll learn the basics of innovation, improve their writing and poster presentation skills, and participate in a number of planned activities that will allow them to work with each other and assigned mentors. The Individual Research Projects will teach new skills and understanding of the work of their respective disciplines. Ethics and Safety training will be provided by the CITI course required of all participants before arrival and by special lab orientation sessions. The Information Transfer sessions provide student innovators with the tools needed to communicate and share their findings effectively with others, with a particular focus on presenting research in poster format. The Medical Hackathon is a hands-on experience that highlights various aspects of the product development process, e.g., working in teams, idea generation, and everything that goes into an innovation. The Shadowing experiences in clinics, inpatient rounds and operating rooms provide opportunities to learn about healthcare careers and their environment. 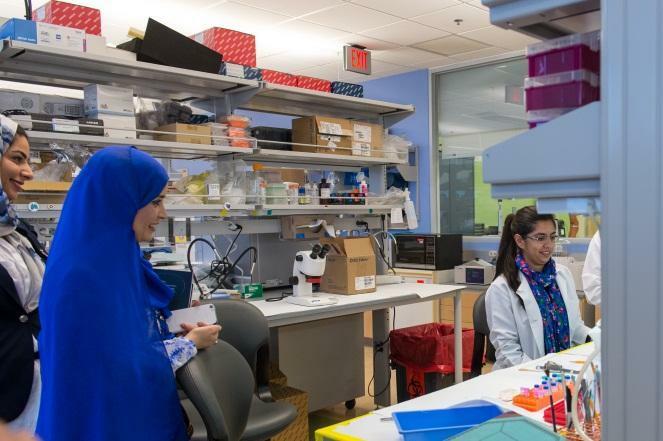 Children’s Research Institute (CRI) will introduce all summer interns to ongoing Translational and Clinical Research specific to pediatrics at noon sessions on Fridays throughout the Summer. His Highness Sheikh Hamdan bin Zayed Al Nahyan, Ruler's Representative in the Western Region of Abu Dhabi visits Children's National Medical Center! We were thrilled to have His Highness Sheikh Hamdan bin Zayed Al Nayhan visit Children's National at the Sheikh Zayed Campus on Friday, June 7th. He was accompanied by his sons, Sheikh Sultan and Sheikh Zayed, as well as UAE Ambassador Yousef Al Otaiba and Deputy Chief of Mission Omar Al Shamsi. The delegation, greeted by Kurt Newman, MD, Mark Batshaw, MD, Tony Sandler, MD, and Pam King Sams, toured the Sheikh Zayed Institute, stopping to see the bioengineering labs, 3D Printer, and Pain Medicine Care Complex. 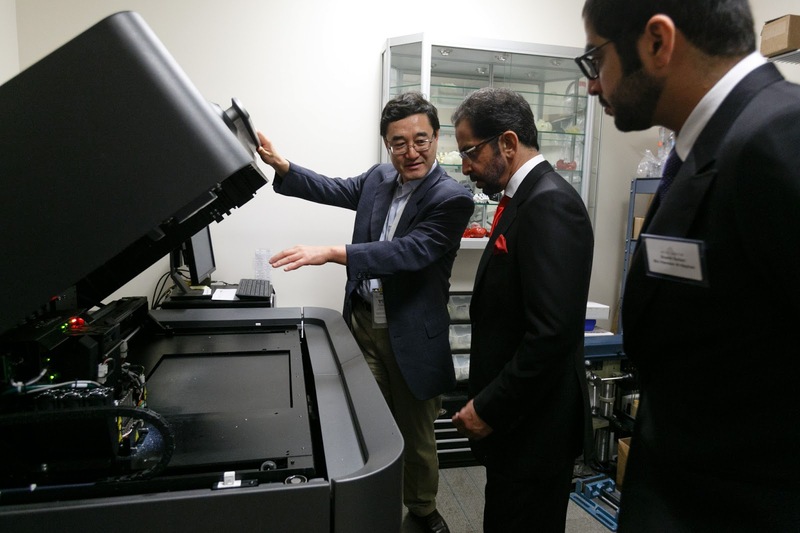 Sheikh Zayed Institute Vice President Peter Kim, MD, led a tour of the Institute labs, making a stop at the 3-D printer and bioengineering labs! The group discussed progress on the Institute's four initiatives, learned about the Student Innovators program, and then headed to the multisensory room where Pain Medicine Program Director Sarah Rebstock, MD showed off the gaming equipment! His Highness Sheikh Hamdan also visited with Emerati children and families, who are receiving medical treatment at Children's National. The group was grateful to visit and witness one of many displays honoring Sheikh Zayed's legacy and vision for the health and well being of all children. Dr. Newman shares a moment with His Highness at the end of their visit. For Mental Health Month (May), we sat down with Angela Fletcher, Psy.D., the Director of the Behavioral Pain Medicine Program of our Pain Medicine Care Complex to talk psychology, and how it relates to pain. In addition, the Behavioral Pain Medicine group has a very rotund, colorful helper: its one-of-a-kind POD bed. 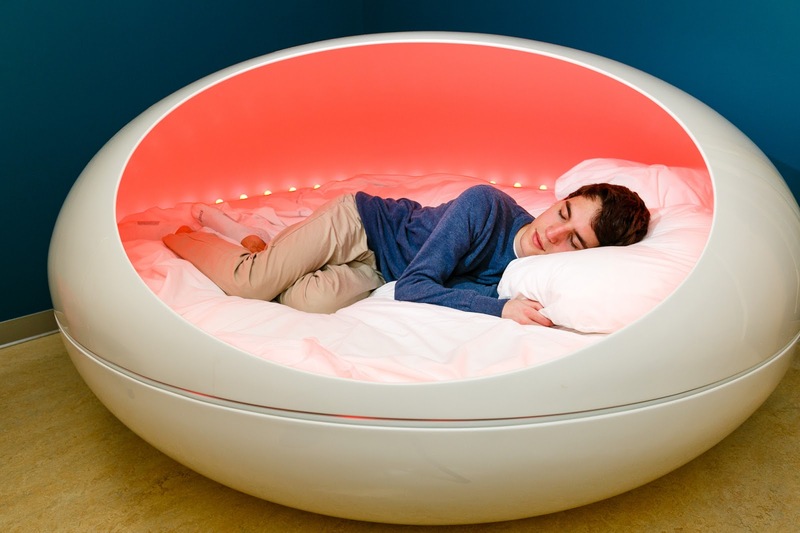 Designed by the man behind the furniture in the movie Men in Black III, the futuristic-looking POD bed was created to help patients to relax and decrease overall pain. The bed will eventually plug into a biofeedback machine that, while soothing the patient, will collect real-time data to measure and track patient improvement. Using soothing, colorful lighting and music synced to the patient’s breathing, a psychologist can help children focus on their inhale and exhale, while measuring their heart rate, muscle tension, skin conduction and body temperature. This information will then be used to help patients become attuned to how their body changes when they are in pain and under stress, compared to when they are calm and relaxed. The Behavioral Pain Medicine team also provides education and training to parents to improve communication, help parents respond to a child’s pain in a consistent manner, and make sure parents encourage the youth to participate as much as possible in daily activities. Dr. Fletcher’s team sees patients in multiple locations around the metro DC area. In addition, the clinic is in the beginning stages of collecting clinical data to track patient outcomes. This balance gives her a unique perspective that connects the world of clinical practice and research. 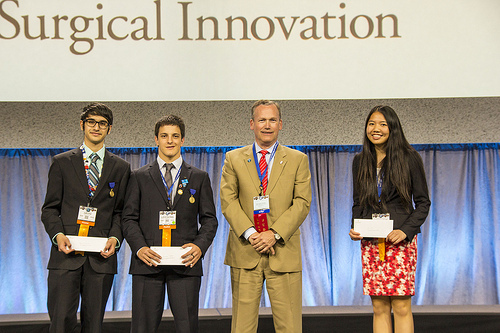 As part of The Sheikh Zayed Institute mission to support young people and innovative thinking in pediatric health-care, four Children's National Medical Center members participated as judges in the annual Intel International Science and Engineering Fair in Phoenix, Arizona. The fair brings together more than 1,500 high school students from more than 70 countries, competing for recognition and prizes based on research projects from many areas of science and engineering. For more than 50 years, the fair has been a major stimulator of education and innovation in science. The Sheikh Zayed Institute also awarded prizes in recognition of innovative work in areas that could promote children’s health around the world. The first prize winner ($2,500), Junyi (Sarah) Wu – from Ontario, Canada developed a rapid diagnostic test for malaria – a disease that affects one-third of the world’s population; the second prize winner ($1,500), Aryo Sorayya from California demonstrated a way to freeze tetanus vaccines to enhance availability to underdeveloped nations; and the third prize winner ($1,000), Luciano Thoma from Uruguay created a glove to allow deaf people to translate hand signing into speech. As noted by Craig Peters, MD, all of these innovations could help children’s health care and well-being worldwide, but also represents the amazing amount of creativity, energy and capability of young people – demonstrated at the ISEF. It was an inspiration for the judges from SZI to see this level of enthusiasm and commitment evident in all of the students’ projects. Posted on behalf of Craig Peters. Institute bioengineer and technical director Kevin Cleary, PhD, often talks about the lack of pediatric focus in image guided therapy development. The unique needs and challenges of treating children require completely unique approaches, not merely adaptation of technology from adult applications. The recent National Center for Image-Guided Therapy Workshop included a visit to Children’s National Medical Center, and focused on issues in developing these technologies for children. 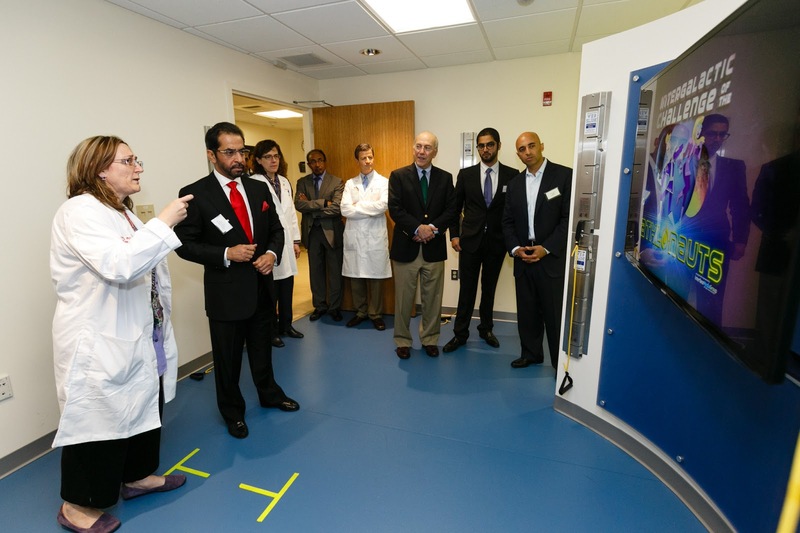 Attendees toured the operating rooms, as well as the working laboratories of the Sheikh Zayed Institute. Children’s National specialists discussed the need to develop treatments specifically for children—as an important, under-served area. Pediatric cardiologist Joshua Kanter, MD, pediatric urologist Amy Burns, MD, pediatric otolaryngologist Brian Reilly, MD, pediatric orthopaedist Matthew Oetgen, MD, and pediatric interventional radiologist Karun Sharma, MD, PhD, discussed the promise and need for further pediatric-focused development, as well as some of the challenges unique to caring for children. Smaller spaces for surgeons to maneuver in. Although laparoscopic tools, including those in current surgical robotics and interventional cardiology, appear small, they are designed for adults. Even smaller tools must be created to efficiently apply to children. The ongoing growth of the patient. Unlike adults, children are still growing, and their anatomy changes as they grow. This is of great concern, for instance, in interventional catheterization procedures—what happens if a child’s artery outgrows a stent? Different movement. Pediatric procedures must consider that children climb, play, jump, and run. Any devices or interventions must be able to withstand the active pace of a child. Some career innovators in image-guided therapies are taking up this challenge because the need and the promise are so great. Through partnerships with pediatric-focused institutions, engineers and physicians work directly with surgeons, radiologists, cardiologists, and others to identify needs and explore new solutions. One example is Gernot Kronrief, PhD, of the Austrian Center for Medical Innovation and Technology, who is investigating whether a novel robotic technology he developed—referred to in his lab as the “deck of cards” robot—could have pediatric applications. The benefits of his design? The robot itself is small, portable and could act as an extra set of steady, reliable hands for instrument placement which could increase efficiency, potentially reducing procedure time. Another pioneer investigating this space is Andreas Melzer, MD, of the Institute for Medical Science and Technology, Dundee, UK . 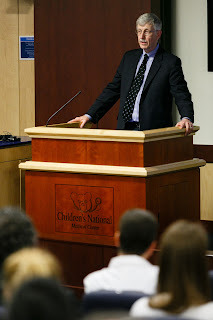 Dr. Melzer has begun discussions with Children’s National radiologists and the Institute’s engineers to develop better programs in pediatrics using interventional magnetic resonance imaging to build more noninvasive procedures using techniques like high-intensity focused ultrasound. Dr. Melzer is helping to develop MR-compatible tools, including ultrasound probes. During the talk, Dr. Collins highlighted several of his institutes’ advancements, noting that they have gained exponential knowledge – on the molecular level, going from a few dozen known disease specific genes, to a few thousand. He also outlined President Obama’s new BRAIN (Brain Research through Advancing Innovative Neurotechnologies) Initiative, which aims to map out complex neural circuits using real time imaging technology, and determine how individual brain cells interact. The program will provide scientists with a better understanding of human behavior and brain development, as well as a clearer picture of common neurological diseases. Additionally, Dr. Collins addressed the many challenges and bottle necks in the research industry, particularly the lengthy and costly timeline of device development and innovation. Nowhere is this more clear than in the development of treatments and devices for children, a real siloed market, and the subject of an upcoming Sheikh Zayed Institute Symposium. He reminded the audience about the costliness of successful developments, a major hurdle to overcome. To help identify those bottlenecks and challenges, the NIH has created the National Center for Advancing Translational Sciences (NCATS) which will – according to their website – “[create] entirely new ways to make the therapeutic development process faster, cheaper, and more accurate.” An example of the work that has come out of NCATS already is a biochip with cells that represent ten different human organs wired with output to give feedback as to the “happiness” or “unhappiness” of the cell after a treatment has been applied, post medicine. Progress made so far has taken less than a year, remarkable progress in such short a time. 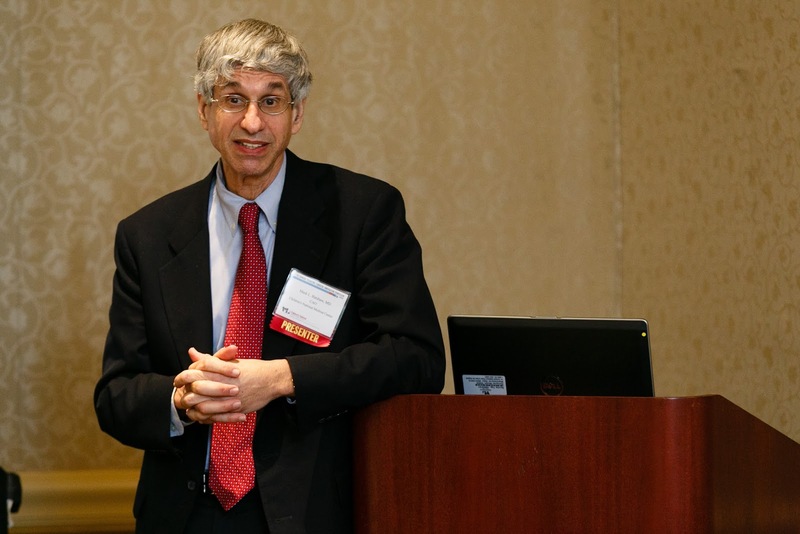 The NIH Director also discussed his own work on a pediatric health challenge-- Dr. Collins has worked extensively to understand the genetic mechanisms of a rare childhood disease--Hutchinson-Gilford progeria syndrome – or, progeria which doesn’t appear in children at birth, but begins to show in the first few years of life. Despite normal mental development, the children stop growing, develop orthopaedic problems, and eventually die around age twelve or thirteen of heart attack or stroke. Unfortunately, progeria is not an inherited condition, making it impossible to predict which child might develop it, and because the life expectancy is so short, studying clinical cases is extremely challenging. Despite this, Dr. Collins’ team discovered the gene mutation that triggers onset of disease (lamin A mutation), and has created preclinical models to study the disease in depth. His passion for pediatrics shined through as he spoke about it—and it is a passion that he shares with the faculty and staff at Children’s National. Sheikh Zayed Institute Awards 3 Junior Scientists! On Saturday March 23rd, Children’s National Medical Center participated in the DC STEM (Science, Technology, Engineering, Math) Fair held at Woodrow Wilson High School in Washington DC. More than three hundred students from 39 middle and high schools around the district, gathered to showcase more than 200 hundred projects, in categories such as Animal Sciences, Chemistry, Microbiology, Plant Sciences, and Engineering. While the judges surveyed presentations, students stopped by to test out the Laparoscopic surgery trainer. Matthew Oetgen, MD, Orthopaedics and Sheikh Zayed Institute bioengineer Wen Li coached them through and helped them get a feel for the device. Students reported that the experience was “really cool,” and were extremely focused on performing the best “surgery,” possible. • 1st place ($300) went to Liyana Ido of School Without Walls High School. Liyana’s project was in the medicine and health sciences category, and highlighted the effects of nutritional agents on the NAD+ content of breast milk. 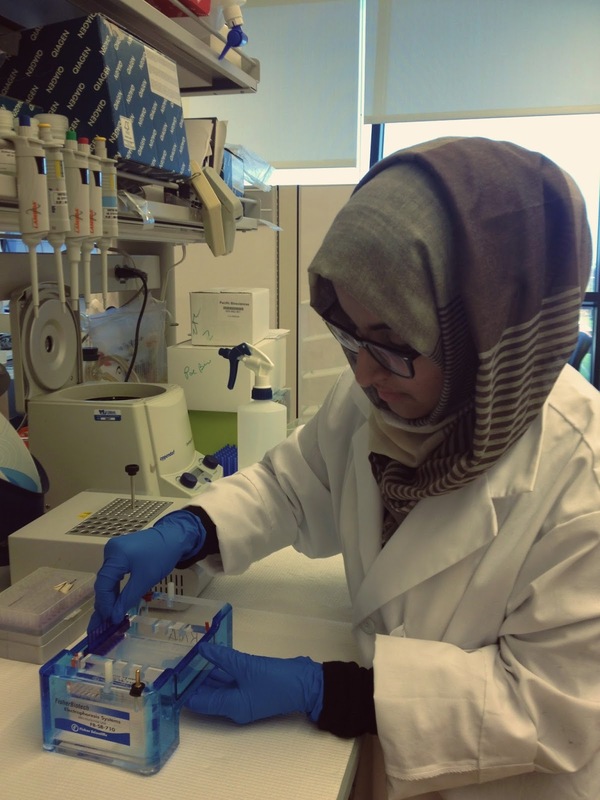 Liyana’s work indicated that a nursing mother’s diet could affect her baby’s metabolism. • 2nd place ($200) went to Anthony Green of Friendship Collegiate Academy. Anthony’s Life Saver project was in the engineering category. This highschooler developed a device that uses both ultrasonic and light sensors to speedily recover and collect objects during a disaster, accident, or explosion. • 3rd place ($100) went to Lauryn Mitchell of School Without Walls High School. Lauryn’s project was in the cellular and molecular biology category, and questioned Allura Red’s role in the cause of DNA damage. Winners: Liyana, Lauryn, and Anthony! The winners will tour the Sheikh Zayed Institute, and collect their prizes during their visit. Monica Hubal, PhD, a personalized medicine and systems biology researcher in the Sheikh Zayed Institute, has been appointed co-Chair of the Molecular and Cellular Regulatory Mechanisms (MCRM) Interest Group for the American College of Sports Medicine (ACSM). The purpose of this interest group is to promote and facilitate basic and translational research efforts that identify mechanisms driving disease and how interventions such as exercise confer health benefits at the molecular and cellular levels. The MCRM group also confers research awards to select students that submit the best abstracts each year on basic science topics, helping to defer meeting and travel costs for undergraduate and graduate student researchers and encourage interest in this research areas. Dr. Hubal is also currently serving on ACSM’s Program Committee, which is responsible for the planning of college's Annual Meeting--the largest gathering of sports medicine professionals of all backgrounds each year. Dr. Hubal started her career as an exercise physiologist and now uses that background to fuel her genetic research into the causes and treatments for childhood obesity. The American College of Sports Medicine's Annual Meeting will be held in Indianapolis May 28-June 3. One theme for the meeting is "Exercise is Medicine," focusing on all the ways that exercise improves the health and well being of people starting even at the molecular level, where Dr. Hubal focuses her work, and including the more commonly thought of physical and mental benefits. A photo can say a thousand words. But can one photo help doctors diagnose Down syndrome? Researchers at the Sheikh Zayed Institute for Pediatric Surgical Innovation are working on a program that could diagnose Down syndrome immediately after birth with non-invasive automated facial recognition software. The early detection of Down syndrome has a huge impact on the prevention of potentially life threatening complications including heart conditions. If suspected Down syndrome can be diagnosed early, no matter where a child is geographically located, immediate preventative measures could be introduced that might save his or her life. The current standard, genetic testing, can be severely limited by geography, cost of the testing, and access to physician expertise. If successful, this software could change all of that. This project is one of four that are taking part in a pilot crowdfunding platform at Children's National. From now until January 31, 2013, anyone with an interest in funding research toward a specific goal in children's health can contribute any dollar amount they see fit, even as little as $1, to the projects they care most about. Please visit www.ChildrensNational.org/crowdfunding to learn more. If you like what you see, please share this link or Like us on Facebook.